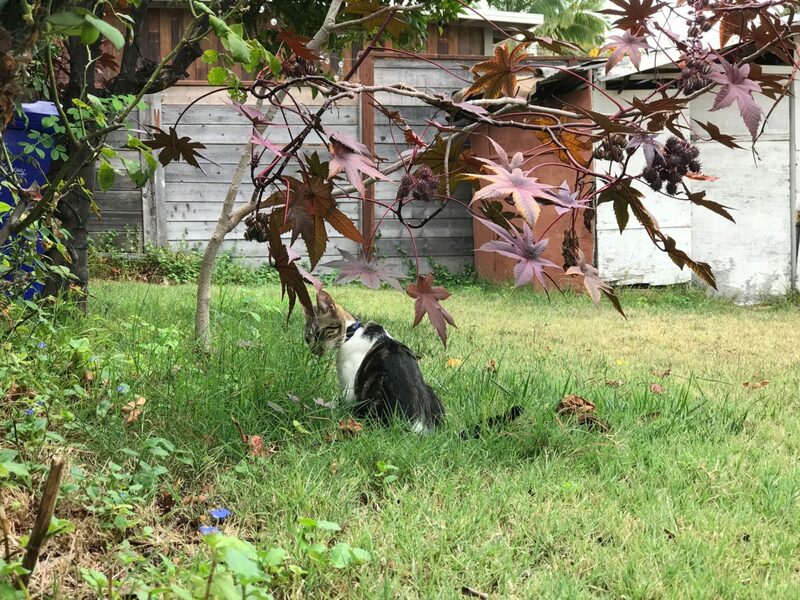 My second-favorite neighborhood feline, The Colonel, is gone. Numero Uno, Fess, is missing—16 days, and as each passes his return grows more unlikely. In June, The Colonel’s owner told me that the majestic longhair had succumbed to “the cancer”. A few months earlier, while on a walk, my wife and I chatted with the woman (and her husband). The kitty had lost weight and, honestly, looked terribly scrawny to me. The family has a new pet, Charlie, whom I first met on June 19, 2017. My struggle since: Getting good-enough portraits, despite several opportunities. Morning of Aug. 15, 2017, while walking down Monroe Ave., I saw a woman petting the cat on North—diagonally across the street from his home. The beastie, who is still a kitten, but closing on a year-old, is a roamer. As the lady turned away, he skirted from the sidewalk into a yard, where chomping grass consumed him for a good 10 minutes. 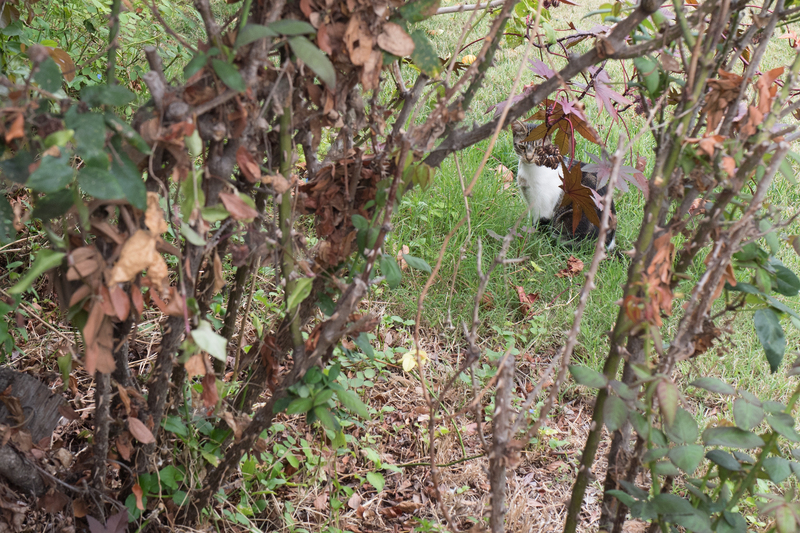 Charlie sat still long enough but leaves obscured him, and a fence interfered with my shooting. I used my beloved Leica Q to start, then switched to iPhone 7 Plus—utilizing its second camera to optically zoom and smaller lens to squeeze shots through the fence. I am not super satisfied with any of the four featured photos when looked at full size. The smartphone gives up too much detail, and the full-frame sensor digicam demands too much close-cropping for comparable perspective. But, hey, I gotta give up getting good looks at this back, and there are plenty; what a camera-shy animal he is! 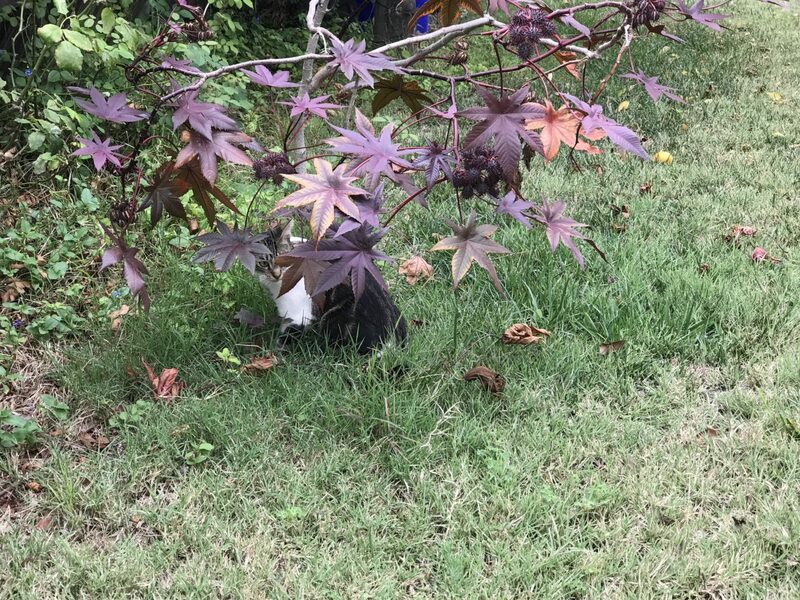 Keeping to my 2017 motto, “everything is an opportunity“, I present Charlie in the wild—lurking in foliage—extending a theme from the series‘ last two features: feral kitten trio and their momma. I shot the Featured Image using Leica Q with manual focus, which is a delightful mechanism controlled by a ring around the barrel of the lens. Vitals, aperture and shutter speed manually set: f/5, ISO 500, 1/250 sec, 28mm; 10:55 a.m. PDT. 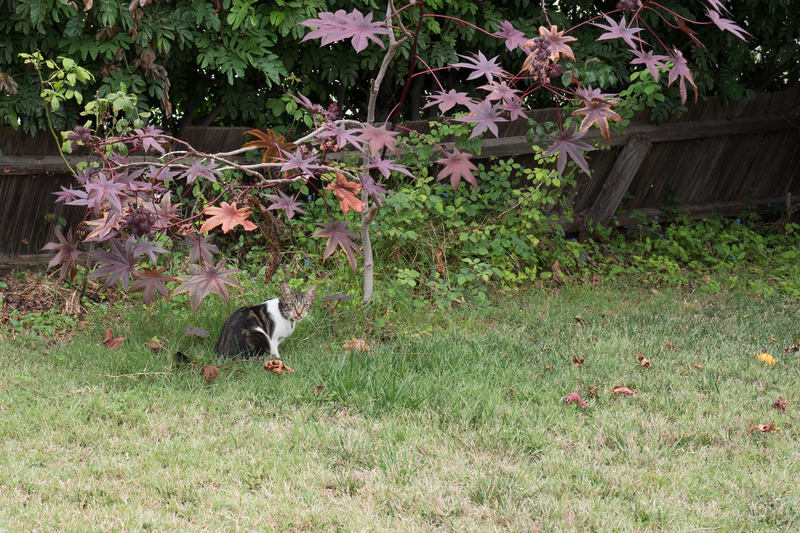 The second photo comes from the same camera, when using autofocus and manually choosing aperture. Vitals: f/5.6, ISO 100, 1/80 sec, 28mm; 10:49 a.m. PDT. The other two are from the smartphone. Vitals for the portrait three: f/2.8, ISO 40, 1/120 sec, 6.6mm. The last is same except for ISO 20—and it is my favorite of the set, captured low to the ground through a space in the fence. Don’t miss: Scruffy, Roly Poly, Woo, Skull, Biscuit, The Colonel, White, Chipper, Frisky, Stretch, Needy, Farfisa, Mates, Hunter, Pee-Pee, Blue, Blue Too, Bonded Pair, Patience, Fess, Jumper, Frenemy, Looker, Cozy, Scout, Lurks, Skit, Mini, Betty, Black and White, Stalker, Bell, Chill, Sammy, Scratch, Poser, Star, Grey and White, Watcher, Herman, Comet, Roman, Willow, Chub, Nimbus, Watson, Lilo, Kit, Pepe, Twilight, Sebastian, Spot, Booger, Ash, Veruca, Riley, Mellow, Bonde, Flower, Glass, Black, BeBe, Fang, Bruce, Siamese, Pounce, Tortie, Haiku, Fraidy, Peso, Daniel Tiger, Dusk, Stride, Dainty, Spry, Tabby, Betty Too, Still, Levi, Shadow, Sophie, Wink, Ferals, and Momma.